Rachel Von | The Journal Gazette Komets' Garrett Thompson, left, moves the puck away from Walleyes' Beau Schmitz during the first period Thursday at the Coliseum. 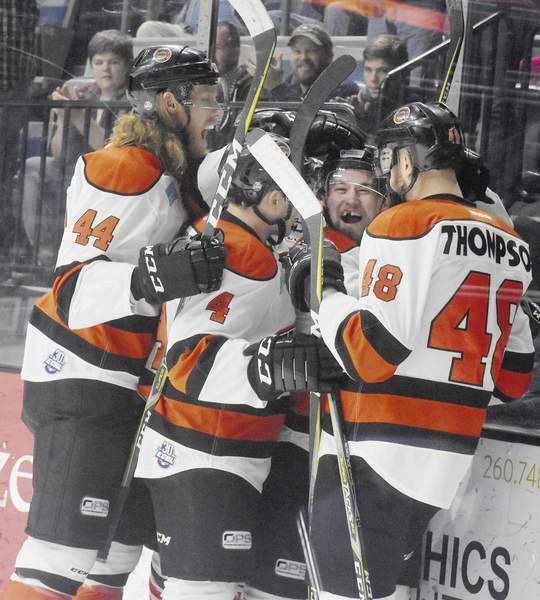 Rachel Von | The Journal Gazette Komets players celebrate with teammate Dennis Kravchenko after he scored a goal during the first period against Toledo on Thursday at the Coliseum. Rachel Von | The Journal Gazette Walleyes goalie Pat Nagle, right, tries to defend the goal against Komets' Shawn Szydlowski during the game on Thursday at the Coliseum. 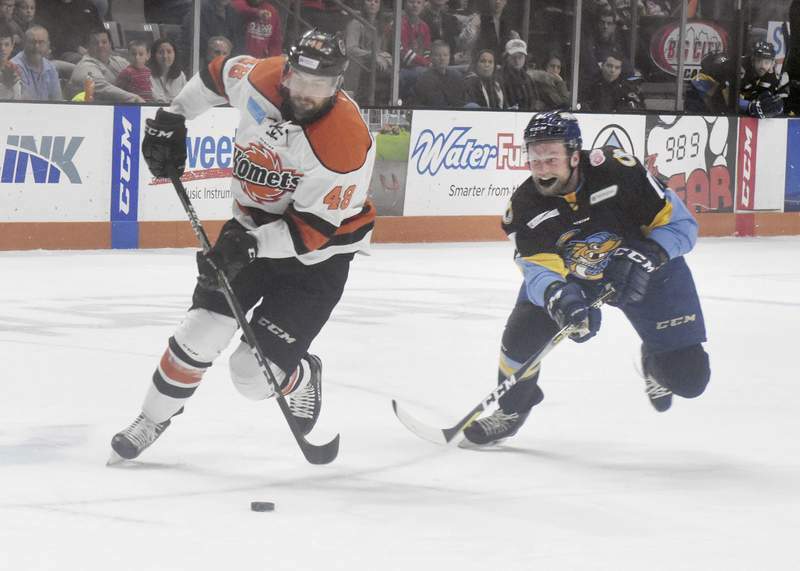 In a wild third period in which both teams scored two goals each in the first five minutes, the Komets held off Toledo for a 5-4 win in the Bob Chase Memorial Thanksgiving Game in front of 7,489 fans at the Coliseum on Thursday. The K's led 3-2 after two, but the Walleye responded with two goals at 3:10 and 4:31 from Connor Crisp and Tyler Barnes. At 4:44 and 5:02, the Komets tied and retook the lead with Dennis Kravchenko's second goal of the game. The Komets got goals from Shawn Syzdlowski after 1:18 of the first period and Kravchenko added another after 3:41. The Walleye scored after 19:53 on a power-play goal by Zach Nastasiuk. Toledo tied it at 2-2 when Christian Hilbrich's shot was over the line before Cody Sol attempted to clear it out after 15:30 in the second. Ryan Lowney's shot from the blue line made it past Pat Nagle after 18:50 in the second to give the Komets a 3-2 lead after two. Note: Before Thursday's game, Marco Roy was called up to San Diego of the American Hockey League. 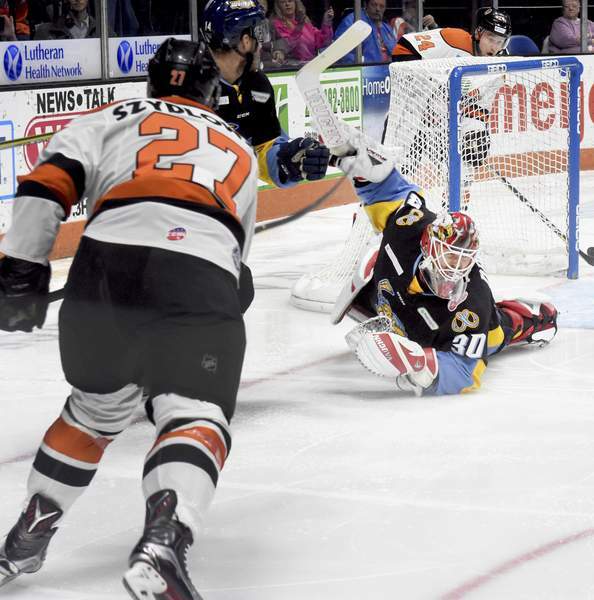 In his 13 games with the Komets this season, Roy led the K's offense with five goals and 16 points. Artur Tyanulin, who was third on the team with five goals and 13 points, was called up Tuesday to Tuscon through the Arizona Coyote affiliation.